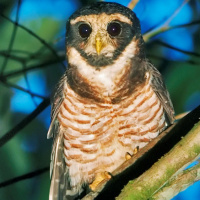 The Band-bellied Owl is a medium-sized to large owl with no ear tufts. Typical calls (pair) - Napo, Ecuado. August 2001. CC Nick Athanas. Description: The facial disc is dark brown. Eyebrows are wide and prominent, while the loral streaks are white, forming 'spectacles'. Eyes are dark reddish-brown to blackish-brown while the cere and bill are pale horn. There is a white patch on the throat bordered by a dark area, with a white half-collar below. Upperparts are dark brown with some paler mottling. The wings are dark, narrowly banded white. The tail is dark brown with about six narrow white bars and a white terminal band. 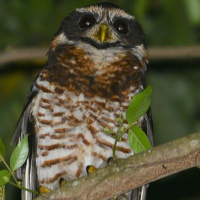 Underparts are buffish-white, with prominent rufous-brown to dark brown bars. The upper chest has a broad brown band, mottled with whitish and buffish tones. The pectoral band is indistinctly broken in the centre of the upper breast. Legs are feathered whitish-buff, while the bare toes are pale greyish-brown. Claws are horn-coloured with darker tips. Size: Length 44-48cm. Wing length 275-325mm. Tail length 163-192mm. Weight 420-500g. 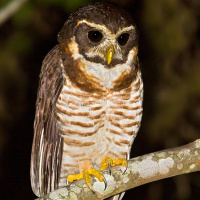 Habits: The Band-bellied Owl is an unsociable bird, and apparently nocturnal. Voice: A rapid sequence of popping notes introduced by a short purring call, with the popping notes having emphasis on the third - hoorr-gogogógog. Hunting & Food: Little known. 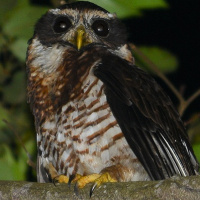 Likely similar prey to the Spectacled Owl - Smaller mammals and birds as well as large insects. Breeding: The breeding habits of the Band-bellied owl are virtually unknown. Probably nests in natural cavities in trees. Habitat: Humid and dense montane forest, locally more open woodland. Ranges from about 700 to 1600m elevation. 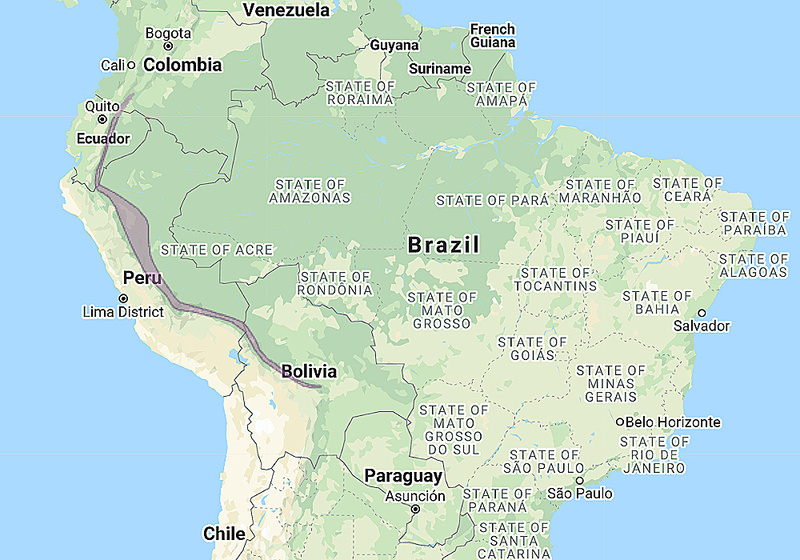 Distribution: Colombia, East Ecuador, Peru east of the Andes and Bolivia. Status: Uncertain, probably rare and endangered. Original Description: Tschudi, Johann Jakob von. 1844. Archiv für Naturgeschichte. In verbindung mit mehreren Gelehrten herausgegeben von Arnold August von Wiegmann. Berlin. 10 (12 vols. 8vo), p. 266.